Water is the most abundant compound on Earth’s surface. In nature, water exists in liquid, solid, and gaseous states. The ocean covers 72% of the earth’s surface and of all the water on earth 97% is salt water while only 3% is fresh – and of that 3%, 70% is locked in ice caps. Seawater is more dense then freshwater, it is composed of 96.5% water and 3.5% dissolved compounds. The ocean is historically alkaline with a pH between 7.5 to 8.4 and an average salinity between 3.1% and 3.8%. Ocean salinity is not actually uniform because the salt in ocean water comes from the weathering of earth’s land surface over time. Water exhibits cohesion, adhesion, and surface tension. Cohesion is the ability of molecules to stick to themselves. In the case of water this is most easily demonstrated in the water droplet. Strong hydrogen bonds are created between separate molecules as the negatively charged oxygen atoms of one water molecule are attracted to the positively charged hydrogen atoms on another. Simply put – they stick together! Adhesion functions in a similar fashion to cohesion and it is also the result of intermolecular forces. The main difference being that it refers to the ability of dissimilar particles or surfaces to cling to one another. 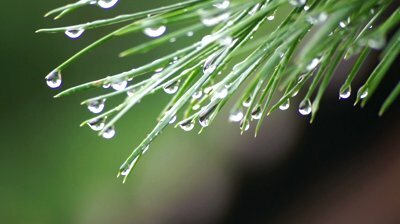 An example of this is dew drops clinging to the needles of a pine tree. The cohesive forces among liquid molecules are responsible for the occurrence of surface tension. Surface tension results from the greater attraction of water molecules to each other (due to cohesion) than to the molecules in the air (due to adhesion). The net effect is an inward force at its surface that causes water to behave as if its surface were covered with a stretched elastic membrane. 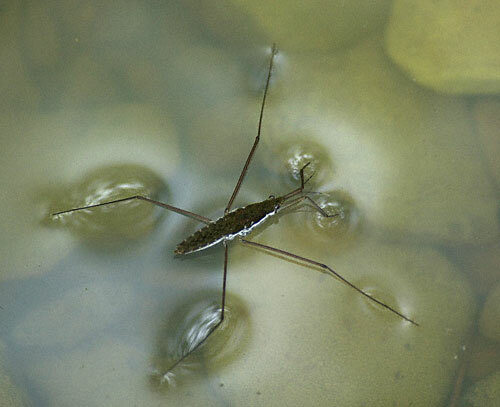 Which is why a water strider, which is denser then water, is still able to run along the waters surface!